Hello all my dear sweet friends! I was away from blogging much longer than I intended. and unfortunately, not all has been good. May's calendar is chock full...I'm exhausted just thinking about it. this one is simple & sweet. We are finally seeing signs of Spring! but at least the daffodils have bloomed! I drove myself nuts playing with dishes of all the colors in the tablecloth. Finally, I managed to narrow it down by removing the majority of them. I told you it was simple & sweet! I really look forward to getting around & visiting all of you soon. Hi Gina! Welcome back! Missed you! Sorry to hear you are so busy and some "not so good." I will keep you in my thoughts and prayers! Love your simple and sweet tablescape. Your got your majolica pieces at Tuesday Morning? Heavens, I need to get there, it's been a long while. Well done, fresh and lovely. Hugs. Have a wonderful Mother's Day weekend!! I missed your tablescapes! This one is gorgeous!!! The dishes are amazing. Beautiful colors. Happy mother's Day! It's all so pretty Gina! I love how the tablecloth makes the dishes pop. I missed you. Another beautiful table. Love the colors. I hope things haven't been too bad. May gets busy.....even for me. This week esp. Glad you are back. 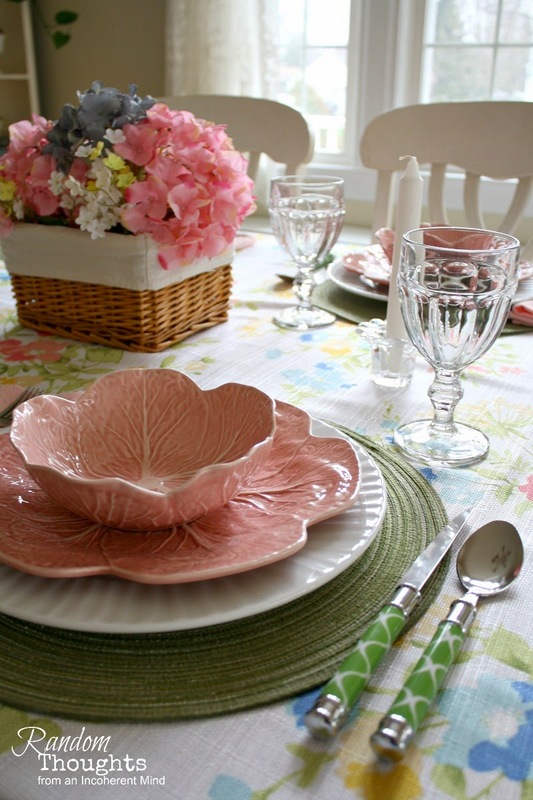 Your table is a perfect reflection of Spring! I was wondering where you were! Sometimes life just gets ahead of us, doesn't it? Your table is beautiful. Love the pink. I knew you'd have something pretty...had to come check it out. Always beautiful. 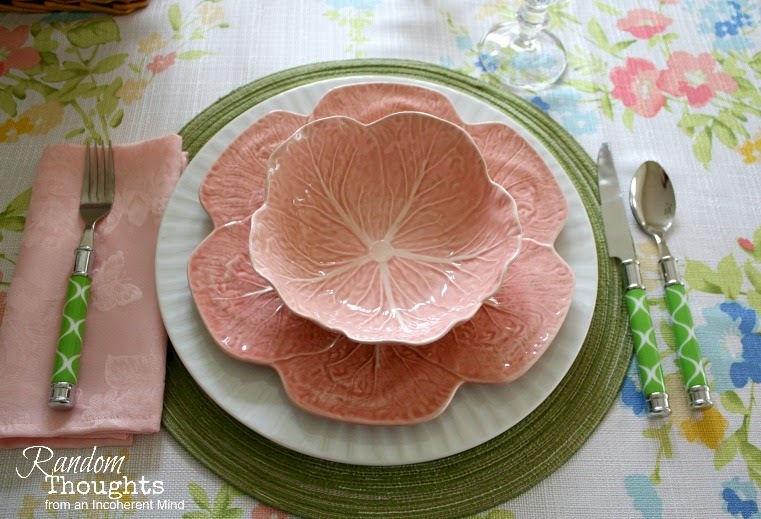 I am in love with those pink cabbage plates. Nice to have you back Gina. Those pink dishes . . . the flatware . . . the tablecloth . . . BEAUTIFUL! I guess I thought I had commented on this pretty post. Darling table scape. Sorry to read about your month being so hectic, and hoping that everything will even out, and get better too. Hate when things go scatty-whompus and we are helpless to do anything about it. May this week be a good one for you and for your family. 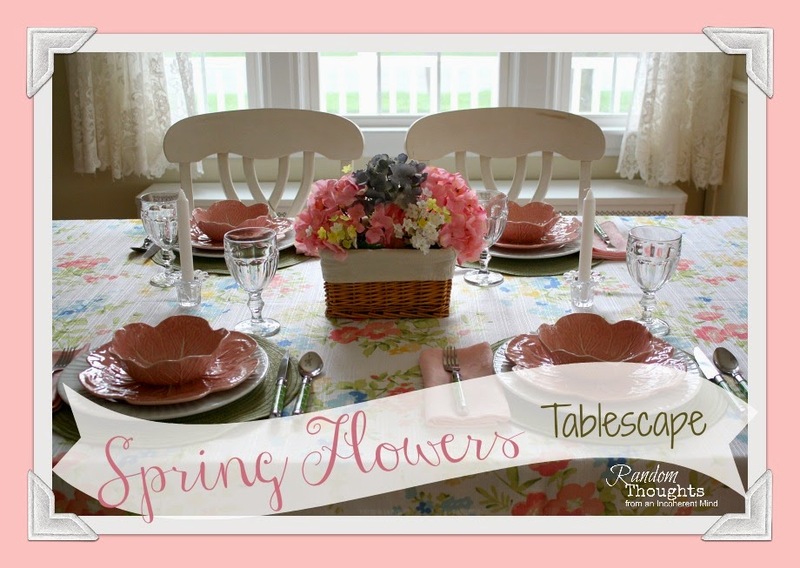 Thanks for the beautiful table-scape inspiration ! Wow, Wow, Wee! Love the table. So fresh like Spring. What a great combination of color. I am your most recent follower. I love the name of your blog. I thought, "Sound like me. Let me take a look." An incoherent mind could not do what you do! Hi Gina and your tablescape is so pretty! 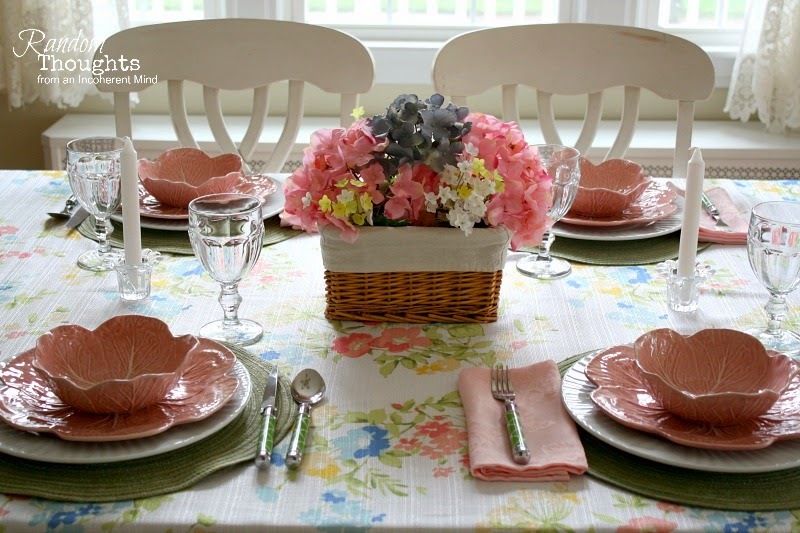 I too, just that springy tablecloth and the pink dishes looks so perfect with it. Oh, I didn't realize you lived in New York! Wouldn't it be great if we could meet up sometimes? Thanks for popping in to see me. So glad to have you back and hope everything is looking better. The tablescape may be simple, but it is most definitely sweet and very pretty. I adore your dishes!